2011 has been a particularly bad year for ticks all over the UK. They can be active all year round in long grass, bracken, heather, woodland and hedgerows, especially where deer and livestock are present. Ticks can carry organisms which may cause Lyme disease, so it is very important to keep an eye out for them. 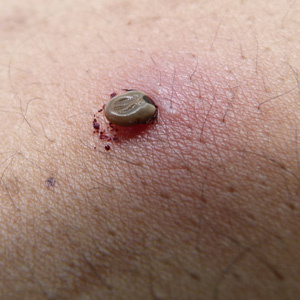 Tick saliva contains various bio-chemicals that act as anaesthetics (which numb the bite area), anti-inflammatories (which prevent swelling), anticoagulants (which stop the blood from clotting), and cement to hold the tick firmly in place. They can feed for up to seven days without causing irritation. The barbs on the tick’s hypostome also keep the tick anchored in place while it feeds. It is during the introduction of saliva, and any regurgitation that may occur during the feeding, that infectious organisms can enter the body of the host, causing disease. It is therefore important to prevent ticks feeding from us. To do this, we recommend that you wear gaiters or long trousers tucked into your socks when walking in long grass. To deter ticks, it’s a good idea to use insect repellent, such as Mosi-guard or Ultrathon, and to check yourself regularly. As the old saying goes – prevention is better than cure! If, when checking yourself you find a tick, it is best to act quickly. The tick needs to be removed with either a pair of tweezers or a tick removing tool. Be careful not to squeeze the body, and aim to remove the tick whole. It is best to wipe the area afterwards with antisceptic wipes. If you experience any symptoms of Lyme disease, seek further advice and treatment from your doctor. We have contacted our friends at BADA-UK (borreliosis & associated diseases awareness UK), a charity who spread the word about ticks and tick-borne diseases in the UK and Ireland. Ray Mears became their patron a couple of years ago after he was diagnosed with Lyme disease, to help spread awareness. We have received from BADA-UK up-to-date information to provide to our clients on courses they attend with us, as well as some fantastic tick removing tools, which are available to buy from BADA-UK. This entry was posted in Bushcraft Tips & Guides on September 2, 2011 by Woodlore Team. My wife & I are very fortunate that we are able to frequent a particular woodland. It does have deer ticks. However they are not distributed in all parts of the woodland. We have discovered that they are mainly in plain grassy areas. Recent tracking work suggests that when deer come into the woods, they move between those grassy areas. So we do not camp there. The safest places in those woods are coniferous stands with no grass. On the subject of removal – the tick removing tools are ideal. However it is very important not to try to rush the process. Apply gentle and continual pressure, and then the tick will eventually let go without leaving mouth parts in place. Grooming is actually pretty important, and its no wonder that some animals pay such close attention to their hair. If you are unlucky enough to get a tick attached to you, the best way that I have found to remove them is to cover it’s whole body with vasaline or Lucas’s paw paw ointment. The tick begins to suffacate and after a few minutes should remove itself. If you try and pull it out you may leave mouth parts in your skin which may lead to a nasty infection. It is a method we used on game dogs all the time in Scotland when I was a keeper. Also works for Bot fly larvae. Seek medical advice immediatly after! Interesting article. Am over in Czech Republic where everyone is well aware of ticks, the dangers and how to remove them safely. Luckily I have only ever had one… The removal tools are great!! !